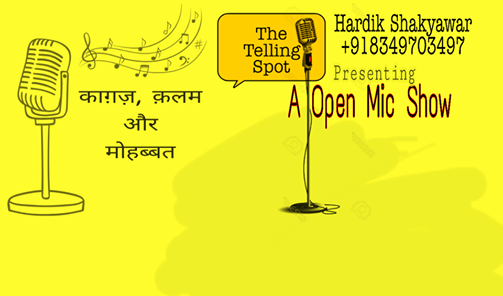 The Telling Spot "A Open Mic Show"
And if you are very happy to now this too please fill this tiny form and participate in the event. Where* Bollywood Café Sai Baba Mandir Phool Bagh Gwalior MP. Entry fee ₹ 100 all performance any time show and a smile on your face. Feel free to bring your friends along.
" This show is permanent in Gwalior "
For registration confirmation call . Hardik Shakyawar (8349703497) call anytime. In this is your first time, write/perform on The Telling Spot and let your fellow writers/performer's give you feedback so that you are ready for the event. # Performance will get many existing offers and attractive prizes. Are you allowed to perform ( Poetry, Storytelling, Rapping, Singing, Stand Up Comedy, Official Video, Live Music, All Instruments and Other Talents. ) For not more than 5 to 8 minutes. All the performance will we recorded and put on The Telling Spot You Tube Channel. So please fill the registration form. Don't forget to share and subscribe to our channel. Have a great time at the event.